The Quality of lives for many children and their parents will improve as result of our Project. The new data will give the Ministry of Health an incentive to implement these programmes nationwide. Having successfully completed three Global Grants Projects in the past, Luton North Rotary Club has received the District International Award 2017/2018 for one of its 3 current projects, a Vocational Training Team (VTT) and Humanitarian Global Grant in Uganda, working in partnership of the Rotary Club of Sunrise, Kampala. 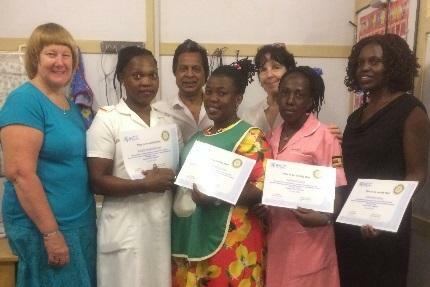 Members of the Sunrise Rotary Club visited the clinic on two days during the training period. The project was supported financially by the Rotary Club of Bloomington, Minnesota, USA and District 5950, for which we thank them. The Award was presented to the Club by District Foundation and International Committee Chair Paul Redwood. In presenting the Award he said, “The Club recognised there is a major problem in Kampala with young children and their ability to hear. They realised that to undertake the project they must first confirm that a community assessment was done. To ensure the longevity it would require a Vocational Training Team to fly out with new equipment coming from three different countries. This is the first VTT that has been carried out in our District. 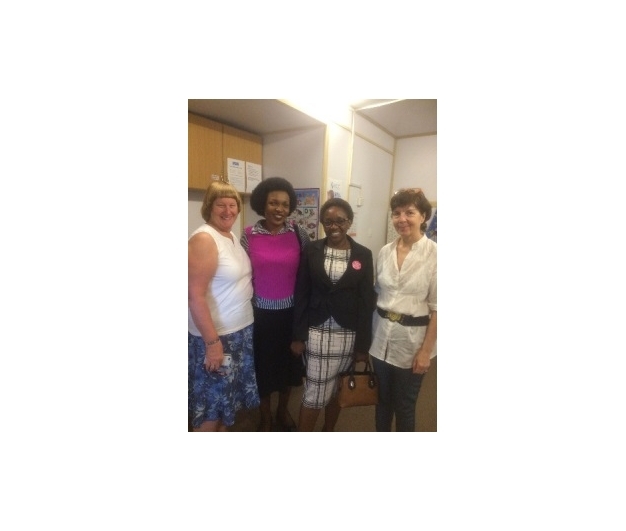 The UK Audiologists that are doing the work have taken their holiday from work to help this amazing project. The benefits will allow around 700 children the be helped every year and this will grow as the Training Team pass on to local people and help them to become self-sufficient”. The Training team comprised Dr Paul Choudhury, retired Doctor from Luton. He is an Honorary Members of the Rotary Club of Luton North and the Rotary Foundation agreed he should be Team Leader in the absence of Rotarian availability. Other Team Members, Pam Layton - Chief Audiologist & Community Audiology Services Manager – Luton and Bedfordshire, and Elhaam Hashim, St Bartholomew’s Hospital, London, Health NHS Trust, Senior Paediatric Audiologist, Testing Children upto18 years of age. to provide capacity building skills for the participants to have extra skills required to treat more children requiring ear treatment. to gain skills to pass on their knowledge to others to ensure sustainability of the work being undertaken by the Training Team. 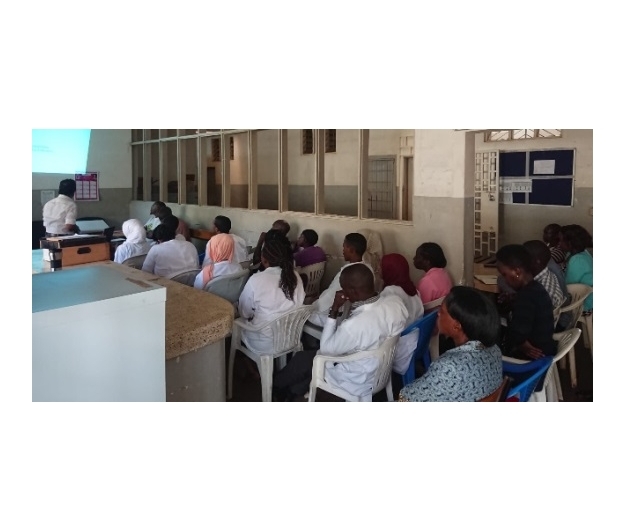 to equip Health Care workers to replicate the service in other Health Care Centres, in Kampala in the first instance. The Humanitarian part of the Grant provided up to date Audiology equipment for the UK Charity Ian Hutcheon for Children (IHCC) which has been supported by the Rotary Club of Luton North for several years. 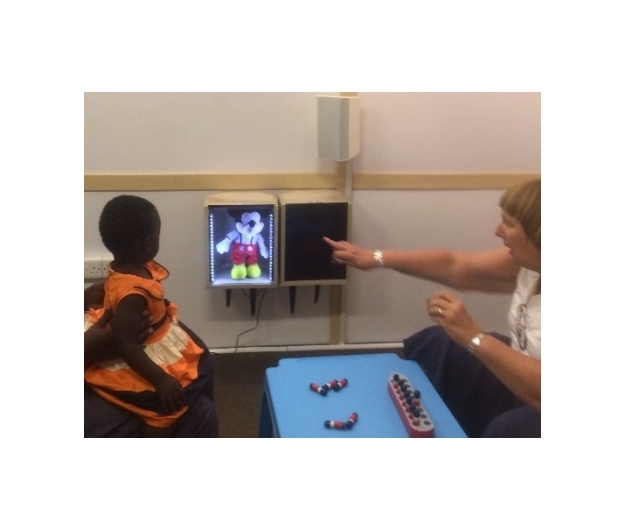 The equipment included Paediatric Visual Reinforcement Audiometry (VRA), the first in Kampala. This provides a distraction test suitable for infants from six months to two years old. Dr Choudhury recalls the smiling face of a mother on being told her baby had perfect hearing. The Rotary Foundation working at its very best. A popular topic was Safe guarding Children and Child abuse. About 49 doctors, nurses, and health care workers and others attended. This was an interactive, emotional, and at times rather controversial session but the issue was openly discussed. 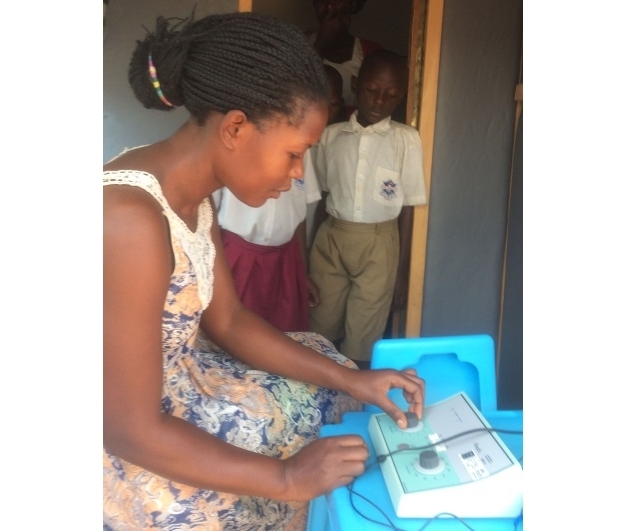 Another result of the project is the new school Hearing Screening Service set up using the Mobile Clinic which was purchased with a previous Global Grant organised by Luton North. A nurse has been trained for the screening and will work under the supervision of IHCC . At the end of the training Team Leader Dr Paul Choudhury reports that the project has been a great success with 20 babies screened on the first day by the new trainees without any problem. 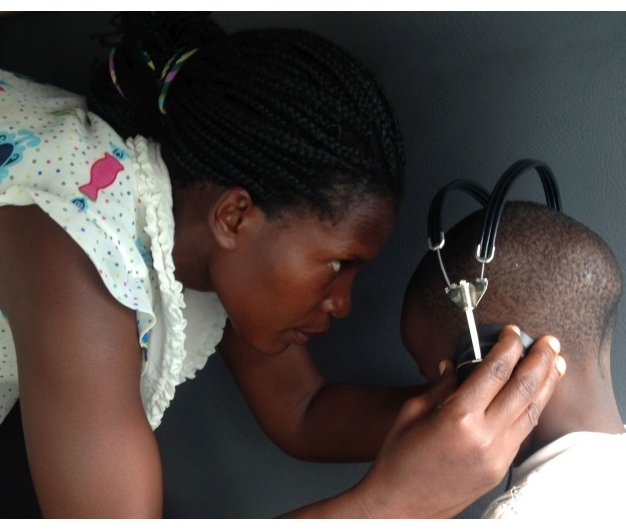 At the same day newly, trained audiologists took the mobile clinic to Kololo Primary School, also problem free. The trainees were given certificates to show that had they successfully passed the training tests. Dr Choudhury also reports that training would have been more effective if an arrangement for the payment of funds was better, with a petty cash advance at the outset, that’s something to remember for the next VTT. When looking at Global Grants it’s the outcome that’s important, not the time it might take to complete. Smiling Faces at the end is what we look for, that’s what this Project has provided in abundance. In addition we have improved the lives of many children, giving them a better chance in life and enabling them to be fully integrated in the community. Parents will lead better lives too knowing that their children have a better chance. We are grateful to Team Leader Dr Paul Choudhury who has been fully committed to the Project from the beginning. He led the team calmly and with great understanding and covered parts of the training syllabus too. Trainers, Pam Layton and Elhaam Hashim, were also committed to the programme and took time with their training making sure the trainees fully understood the information being presented to them. They were pleased with the results when the trainees were put to test and more so later when they were live in the Clinic. The whole programme was conducted in a very professional way and the Team fulfilled their role as ambassadors for Rotary Foundation fully. President Michael Dolling, Past President Syed Rahman and all members of Luton North thank the Team most sincerely for the work they have done on behalf of the Club and our partner the Rotary Club of Sunrise Kampala, Uganda. We are very proud of you. Thanks also to Liz, John and Abul for being part of the project, playing full supporting roles. Leslie Robertson and I have worked closely with you over many days and it has been our pleasure. We now look forward to receiving the Team's Report and presentation to our Club. Dr Paul has said that he will be pleased to visit other Clubs to talk of their experiences and these can be booked through me by email, pauldenton305@btinternet.com. THE ROTARY FOUNDATION DOING GOOD IN THE WORLD.